To beat some Saturday mid winter blues we headed to the Experience Music Project (EMP) Science Fiction (SF) Museum (empsfm.org). I have to say we were pleasantly surprised at the Science Fiction Museum. The SF part is very book-centric which wasn’t what we were expecting, but we appreciated it. The EMP presentation “style” - memorabilia behind glass cases – is largely how the SF part is set up as well. In particular, in the exhibit called Homeworld books have the main stage. You literally walk through and get a sense of several dozen or more key science fiction works. The works are grouped together by theme and short information plaques describe each work in a nutshell. After this, you go to the lower floor for the exhibit called Fantastic Voyages where books are less key, but still featured. After going through through these exhibits I wrote down a list of a dozen or so books that looked interesting that I’d never heard of before. On this particular visit we also caught the fun exhibit Gelatine Lux (November 21, 2009 – April 11, 2010) featuring Italian glass artist Maria Grazia Rosin. In this exhibit, glass, sound, light, and video come together in 20 suspended sculptures reassembling marine and microscopic life. We were prepared to sit back (in our plushy seats at Gold Class Cinemas) and hate this movie last night, but, we ended up liking it. It helped that we went with friends (a birthday celebration of sorts) and food and drink were involved – as is always the case. 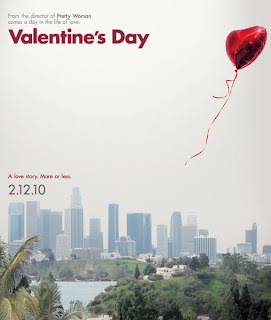 The movie in a nutshell follows the intertwined stories of old, new, and spurned lovers in Los Angeles with a happy ending for all. Afterwards, we headed west, back over the bridge, to Sambar for pommes frites and cocktails. Now, that is an even happier ending. On our way out of the Imperial Valley on Sunday we stopped at Celia’s Restaurant in El Centro (location) for a special quesadilla. A special quesadilla is a deep-fried flour tortilla, crimped like an empanada and filled with quesadilla cheese. Apparently the recipe originated in this area but never really spread further much to the chagrin of people with fond memories of them and who now live elsewhere. I heard this second hand: the idea of deep fried, cheese-filled quesadilla is really the product formed at the intersection of Mexican and American culture as occurred and continues to occur in this area. And the verdict on the taste of the special quesadilla? Very good. You can order one and one or two tacos and be satiated. The other spot to snag a special quesadilla that keeps coming up is at the Mt. Signal Café* named after the nearby Mt. Signal. There is always the next visit. * from Anonymous 2010-05-25: "Sorry dude, but Mt. Signal has been closed for about two years. Camacho's though has the best special quesadillas around. Just ignore the roaches on the walls! " Update 2011-06-02: We tried a special quesadilla a Camacho’s Place discussed here. The Desert View Tower is the kind of roadside attraction that if you would never visit if you lived nearby. But being out of town gives me liberty to make touristic demands to see quirky attractions like this. And so we took a break from the white-knuckle driving of I-8 and the watchful eyes of the numerous US Border Patrol along the highway and pulled off on In-Ko-Pah County Road and drove a few miles to the Desert View Tower. The 70 foot stone tower provides panoramic views east over the Imperial Valley. A couple of bucks per adult gets you into a curiosity shop of items surrounding the base of the tower, a climb up the tower, and then access to Boulder Park behind the museum. We all agreed that while the view from the tower was nice, the Boulder Park with its twisting paths and carved figures hidden in the boulders was really the more interesting part. The tower was built by Bert Vaughan in the 1920s as a roadside attraction appealing to those who stopped to give their vehicles a rest after climbing west up out of the valley on their way to San Diego. Back when the first road opened from San Diego to the Imperial Valley cars needed the rest. The I-8 highway is unusual for its steep grade (4,000 feet in 11 miles) and the fact that when you descend into Imperial Valley (going east) you go from a few thousand feet to 52 feet below sea level at El Centro. Going below sea level makes one hungry for Johnny’s. It’s a fact. ½ of Travelmarx grew up in the Imperial Valley and has fond memories of Johnny’s Burritos. So today on a swing through the valley we stopped. For today’s lunch it was burritos, taquitos, tostadas, and menudo, a tripe (cow stomach) soup. Delicious (even for the ½ of Travelmarx who didn’t grow up in the valley.) You can join Johnny’s Facebook page here. There are two Johnny’s locations: Brawley and a second location in Imperial.